The Stokesay Ware range of doll's house china recreates classic English designs in miniature using completely authentic materials and techniques. 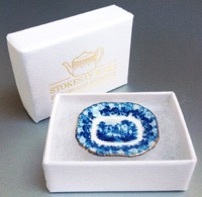 The pieces are made by hand from bone china, glazed and decorated with ceramic enamels and 22k gold which are all permanently fired on in the kiln. All the china illustrated in these pages is unique to Stokesay Ware. As we make everthing ourselves all our shapes, moulds and artwork are entirely exclusive to us. It is made in the internationally recognised scale of 1/12th, meaning that one foot in full size is represented in the doll's house as one inch. Our first eBay listings have gone live this week. Read more about it in our BLOG→ and don't forget to check back here for the latest news. We are looking forward to our next shows at the Nec and Kensington and are planning some exciting new work for them, so do come by and say 'Hello'. Our next show in 2019 will be Miniatura at the end of March followed by the Kensington Doll's House Festival in May. Please turn to our EVENTS→ page for more information. We will be closing down as usual for June, July and August, starting back to work on the 1st of September. Our limited edition plate, Chelsea LE701 'Calico' is available at shows and by mail order. Please visit CHELSEA LE701→ for more information.